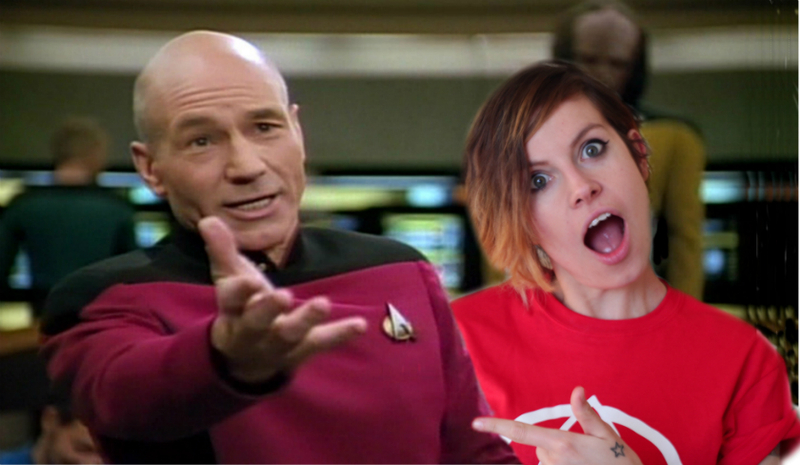 ‘ Jean Luc Picard and Me’ is a one woman show from Ellen Waddell that explores the role that Star Trek characters can play within the formative years of a childs life. But with funnies. I’ve known Ellen for a while courtesy of that hot mess Andy Price over on Chaplin Comedy. She featured in episode of 1 of Bristopia which pretty much confirmed that she is better at most things than Andy and I. Which is just as well, because she’s the one with the solo show. Well, almost a solo show. Throughout the performance, a lifesize, if crude JLP (Jean Luc Picard) stands guard, overlooking the audience like a father figure (topical). JLP reminds me of Wilson the volleyball from Cast Away: driving our story forward, but motionless and unaffected by the emotions and actions of those so fragile around him - like a big man sized metaphor. The hour show charts Ellens childhood and eventual distant relationship with her Dad, her relationships with boys (giggle), and a whistlestop tour of her time in Los Campesinos of whom I own at least one legally procured album. Throughout the performance, I couldn’t help but wonder, who would be my Jean Luc if I was to put on a solo show. Do we all have a Jean Luc Picard? I decided that mine is probably Matthew Corbett. Of course there were many a Star Trek reference, luckily being a Trekkie was not a prerequisite for understanding or enjoying the show (n.b why isn’t there a breakfast cereal called ‘Trekkies’). The whole performance is accompanied by a slideshow presentation which also includes dialogue queued up for our friend JLP. If you’ve seen any Dave Gorman stand up, you will know how successful a well timed pie chart can be. Photoshopping various Star Trek characters heads onto other family members is always going to be a hit and the slides provide some of the funniest material including the absurdity of the love story entwined in Jurassic Park 3 (an island inhabited with ravenous dinosaurs seems to be the perfect place to rekindle romance according to Hollywood). Is it a comedy performance then? It isn’t billed as one, but it certainly lends itself to a few laughs. In the same way that stand up comedy relies on story driven narrative to loop back around, Jean Luc Picard and me leaves plenty of room for self-deprecating LOL’s whilst still managing to remain a story rather than a number of gags woven together with geeky in-jokes told in Klingon (although naturally there are a few). If honest, it’s not like anything I’ve seen live before, with a title like that I’m not sure that is was ever going to be. What I do know is that I laughed throughout and now have a weird urge to scour charity shops in the hope of finding enlightenment in obscure nineties TV icons. Maybe my Jean Luc is Hasselhoff? You can see more of Ellen's work over on her website, or listen to the hilarious podcast that is Bristopia here.